Highland Place (Highland Place north of the multi-family residential buildings on Foothill Boulevard to West Hillcrest). Keefer (North Myrtle and North Ivy between Foothill and Greystone; an addition to the North Encinitas Historic District). Wild Rose (extends the Wild Rose district up to Foothill). Oak Woods (Oakglade Drive, Ridgecrest Drive, and Briarcliff Road). Bliss (bounded by Wild Rose on the north, Mountain on the east, Lemon on thesouth, and Shamrock on the west). Sombrero Ranch (Lemon Avenue on the north and Orange Avenue to the south. Includes both sides of Sombrero Road, Terrado Drive, Ranchito Road, and Vaquero Drive). Downtown East Residential (bordered by Ivy on the west, Colorado on the south, Shamrock on the east, and the buildings on the north side of Lemon Avenue, as well as those on the south side of Palm between Ivy and Canyon Boulevard). Falling Leaf (bounded by the north side of East Walnut, South Shamrock on the east, East Maple on the south, and South California on the west). Cherry Avenue (bounded by East Cypress on the north, Sherman Avenue on the east, East Fig Avenue and East Central Avenue on the south, and South Ivy on the west). Parker Avenue (includes the east end of Parker Avenue starting at South Mayflower Avenue and continuing approximately half-way down the street, ending at 536 on the south side of the street and 547 on the north). Esplanade (bounded by West Chestnut to the north, West Huntington to the south, Monterey to the west, and South Mayflower to the east. Anita Ranch (the south side of Anita Street from the cul-de-sac to Alamitas Avenue to the east. Well, so the historical preservation busybodies will need more bodies to tell property "owners" how and what to do with their homes and commercial buildings. Having unelected nosey people tell others what to do with their property (so that the nosey parkers can feel good about themselves and freeze Monrovia in time, or the time these savants imagine to be the best ever) sounds like something out of East Germany, not East LA County. Handing off control over other people's property to the morally and aesthetically "superior" doesn't do much for individual freedom or innovation. It's tres "progressive", though. Hillary and Obama would approve. So would the Vietnamese Communists, with their fabled People's Committees which organized" villages to their highest use. I lived in Pasadena when a group of credentialed idiots decided that 1762 was the best year ever for the Arroyo, and every house in a certain area needed supervision of a committee of the same idiots to dictate building plans, planting and/or removal of vegetation and external color schemes to move toward the optimum replica of 1762. Of course, there were no houses in the Arroyo then so the credentialed were somewhat challenged when questioned about what external color schemes might meet with approval. The proposal was finally withdrawn. Monrovia needs to allow time to pass, and adapt to, not deny market trends, which is another term for "how do people really want to live". The City and School District are going to need a larger property tax base to support their functionally bankrupt states. There will be long-deferred infrastructure projects to pay for that state monies, when reality explodes in Sacto, will not be coming. The schools already depend significantly on other people's money. Monrovia itself can't pay the bills. What happens if/when reality explodes elsewhere? 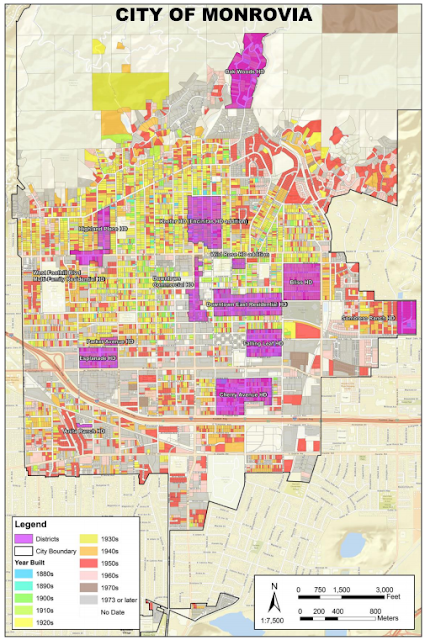 That means older buildings and homes, things that may make a small noisy group feel good about "preserving our neighborhoods" may not keep up with reality and Monrovia could be bypassed as people look for places to live, and find nothing attractive here. Not to mention an attitude of "you better want to live like someone's grandfather did, or don't come here". Millennials are finally moving out of their parent's houses, getting married and moving out of collective hives so wonderful to the credentialed urban planners. People like having their own dirt, and making it their own. Static communities, in place for busybodies to exert themselves, will not survive. Don't forget that as houses sell, they are reappraised to market under Prop 13. If a city wants more property tax revenue, it should encourage land-use rules (to include the role of busybodies) so that there is turnover. Change is hard and bumpy. Life is not for the faint, and busybodies should be minimized, not enabled.